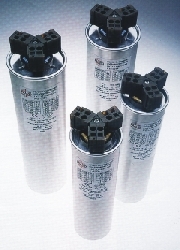 FRAKO Power Factor Correction Capacitors are components with very high power density. supressed. This is achieved by using a flame inhibiting mineral filler. - safe reaction at overload and during possible breakdowns. and in particular a higher RMS current load when resonances occur. capacity. At 400 VAC mains voltage FRAKO uses only power capacitor rated at 440 VAC. - 2 times the rated current at 400 VAC / 50 Hz permanently. - 350 times the rated current at 400 VAC / 50 Hz during short peak currents. than 1% in 15years of operation. possible standard of safet at overload and at the end of their life time. Management System Certificate ISO 14001.
polypropylene foil. Dry type, filled with a flame inhibiting, stabilized mineral filler. that the capacitor is disconnected from the mains. Rating: 2.5 - 25kVar at 400V / 50Hz. discharge resistors. Approx. 0.02 % (0.2 Watt/kVar) measured at the capacitor coils. which guarantess a discharge to 75 VAC within three minutes. 50 VAC within one minute. Voltage Load Capacity: FRAKO Power Capacitors have a load capacity in accordance with VDE 0560, part 41.